Here's a new video in which The NIST World Trade Center report for the Twin Towers is examined and shown to be false and unscientific. Bob Coen, who made the film "Anthrax War," has also launched a new site that is in preparation for his new film. Three years ago, the British Broadcasting Corporation (BBC) put out another episode in its ongoing “Conspiracy Files” series of programs. This series has covered many issues of public concern about government reports on inexplicable events, including the Lockerbie bombing, the 7/07 London bombing, the Oklahoma City bombing, and the mysterious death of microbiologist David Kelly. In every single case, the BBC program concludes that there was nothing to worry about, that the official reports are correct, and that citizens should just go about their business and trust the government. The 2008 episode was a second such program covering the events of 9/11, this one focused specifically on World Trade Center (WTC) building 7. It was entitled “The Third Tower” and surprised millions of people around the world by stating that the mystery surrounding the collapse of that 47-story building, which fell into its own footprint in 7 seconds, had finally been solved. The BBC told us that the US government investigators would soon put all our minds to rest regarding this inexplicable event. That was far from the truth, however, as this earlier blog post makes clear. In 2008, I had the opportunity to view a re-run of this program on the internet. After doing so, I wrote to the program’s producer, Mike Rudin, offering suggestions for improvement prior to the revision of the program for world-wide consumption. The letter I wrote is below. Rudin must have been impressed as he asked to speak with me on the phone and we did so later for about 30-minutes. Basically, he is a very nice propagandist who is not willing to address the facts or correct his mistakes. This year, for the tenth anniversary, the BBC and Mike Rudin are planning another episode on 9/11. Unfortunately, it is not expected to be an apology for the BBC’s promotion of war and societal destruction through promotion of the official conspiracy theories. Instead, word on the street is that BBC will attempt to smear and discredit professor Niels Harrit, whose paper on nanothermite found in the WTC dust has gone unanswered in the mainstream scientific literature for two and a half years. BBC has interviewed at least one known disinformation specialist for the purpose, and has once again declined my offer to help. Of the many unanswered questions about the attacks of September 11, one of the most important is: Why were none of the four planes intercepted? A rough answer is that the failure of the US air defenses can be traced to a number of factors and people. There were policy changes, facility changes, and personnel changes that had recently been made, and there were highly coincidental military exercises that were occurring on that day. But some of the most startling facts about the air defense failures have to do with the utter failure of communications between the agencies responsible for protecting the nation. At the Federal Aviation Administration (FAA), two people stood out in this failed chain of communications. One was a lawyer on his first day at the job, and another was a Special Operations Commander who was never held responsible for his critical role, or even questioned about it. The tragedy at the World Trade Center (WTC) on September 11th, 2001 continues to affect many thousands of first responders who sacrificed their own health while restoring lower Manhattan and attempting to recover survivors and victims’ remains. Recently, H.R. 847, otherwise known as the James Zadroga Bill, was signed by President Obama in an effort to provide services and compensation for those whose health was compromised through exposure to the toxic dust and gases at Ground Zero. However, these first responders also need help to understand how their illnesses originated so that improvements in treatment can be made. 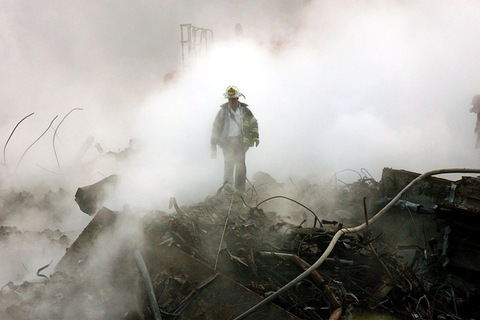 In response to this need, concerned citizens should consider the possible correlation between evidence for energetic materials at the WTC and the environmental exposures which appear to have caused so many illnesses in the first responders. Nothing moves through the path of most resistance, and certainly not the human mind. A recent article written by journalist Robert Parry has provided another good example of this long-standing fact. In that article, Parry exhibits an astonishing lack of knowledge about the truth movement and the questions posed by honest 9/11 skeptics as he attempts to publicly denigrate those questions and people. The well-respected journalist Parry provides excellent examples, throughout his article, of how normally reasoned and well-researched professionals can suddenly turn into people who cannot deal with facts or evidence. Unfortunately, Parry’s comments are correct in one sense as demonstrated by another article published in response to his. For some people, the 9/11 truth movement is a parlor game. Here is the video from the historic broadcast of Loose Change: 9-11 An American Coup on Colorado Public Television Channel 12 on December 4, 2010. Featured in-studio guest is 9-11 whistleblower Kevin Ryan and members of Colorado 9-11 Visibility manning the phones. Trevor Carey of Denver Late Night on KLZ 560 am in Denver Colorado welcome 9-11 Whistleblower Kevin Ryan and Shari Bernson, Membership Director/Executive Producer at Colorado Public Television to talk about the December 4th airing of Loose Change 9/11: An American Coup. George Flynn and Words of Freedom welcome 9-11 Whistleblower Kevin Ryan and Shari Bernson, Membership Director/Executive Producer at Colorado Public Television to talk about the December 4th airing of Loose Change 9/11: An American Coup. Updated: the original Youtube video was censored shortly after I posted it, a year go. Better rip it if you want to keep it, because it isn't available anywhere else. "I know what America is, America is a thing you can move very easily, move it in the right direction. They won't get in the way." Video highlights of lectures presented by Steven E. Jones, Ph.D. and Kevin R. Ryan in 2009. Will Lee Hamilton examine the evidence? This week, ABC's Nightline televised an excerpt from an interview with Lee Hamilton, former vice chairman of the 9/11 Commission. The purpose of the interview excerpt was to suggest that those who produced the official reports of what heppened on 9/11 are willing to openly examine all evidence related to those crimes. Since I've met with Mr. Hamilton privately before, I exchanged a few messages with him to follow-up on my previous attempts to get him to examine the evidence in a public forum. Due to the critical nature of this question, I'm posting the exchanges here for the record. The National Institute of Standards and Technology (NIST) has had considerable difficulty determining a politically correct sequence of events for the unprecedented destruction of three World Trade Center (WTC) buildings on 9/11. But despite a number of variations in NIST’s story, it never considered explosives or pyrotechnic materials in any of its hypotheses. This omission is at odds with several other striking facts; first, the requirement of the national standard for fire investigation (NFPA 921), which calls for testing related to thermite and other pyrotechnics, and second, the extensive experience NIST investigators have with explosive and thermite materials. Note: for better readability, we have removed important references to this online version of the paper. The original published version contains several pages of references.